Are YOU ready? … for a flood, a tornado, an earthquake, a lengthy power outage or other type of natural or man-made disaster? Learn how to prepare and how our area emergency responses teams do their part. We’ll also hear an update on the Handy Helpers Home Repair program from Tracy Gander of Catholic Charities. Whether you’re already using social media among your Neighborhood members or you haven’t even ventured into the first steps, you’ll pick up something to put to practical use and even have opportunities to share from your own experiences. 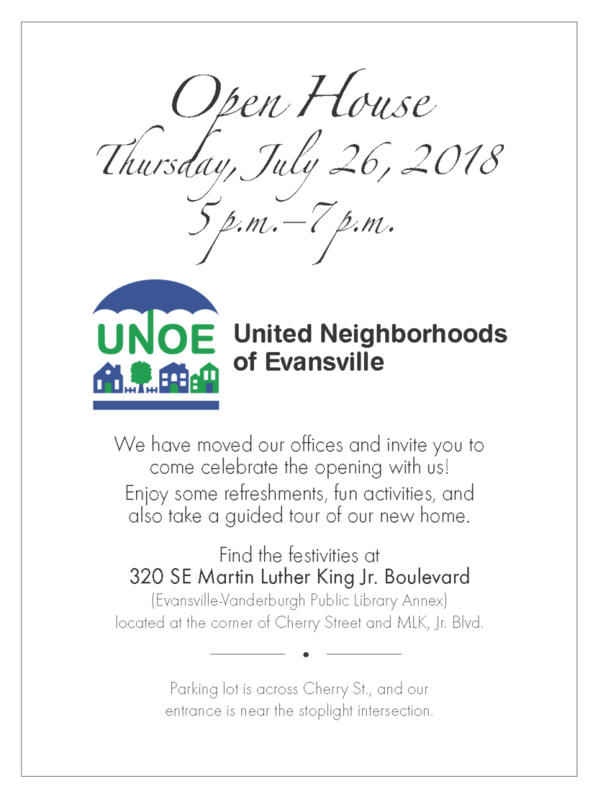 This meeting includes the Annual Election of Officers for United Neighborhoods of Evansville (UNOE). Nominations are open until the time of voting during the General Meeting. 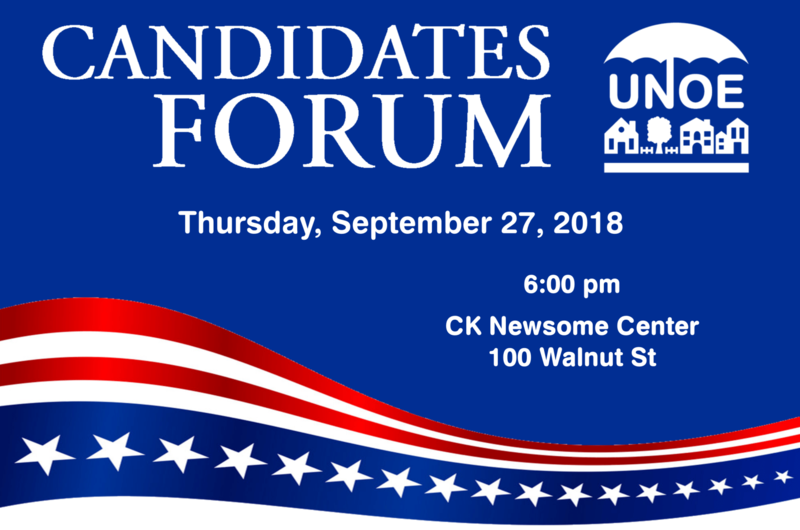 REMINDER: Only Neighborhood Association UNOE Representatives can vote in the elections! Each member Neighborhood may have up to two representatives. Please make sure your voting UNOE Representatives or proxies must have been updated with the UNOE office by 12:00noon today, Jan. 24th. No proxies will be added at the meeting. 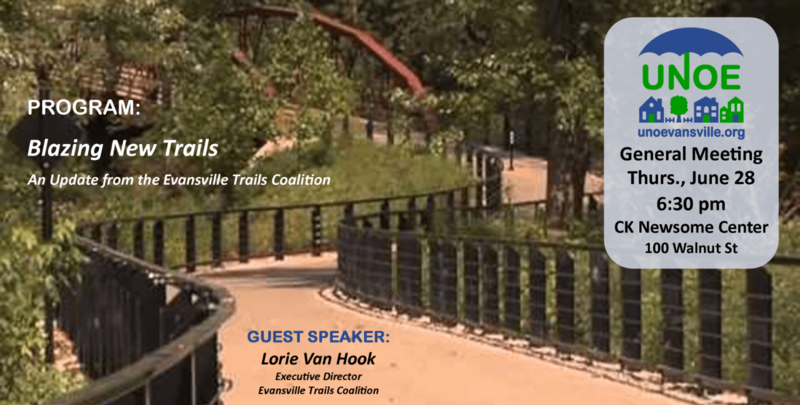 Join us for our May General Meeting on Thurs., May 24 – 6:30pm at the C K Newsome Center, 100 Walnut St.
Our guest speaker will be Dr. Ashley Jordan, the new Executive Director of the Evansville African American Museum​, bringing the program Resurrecting a Front-Porch Community. Join us for the May General Meeting! Join us for our April General Meeting on Thurs., Apr. 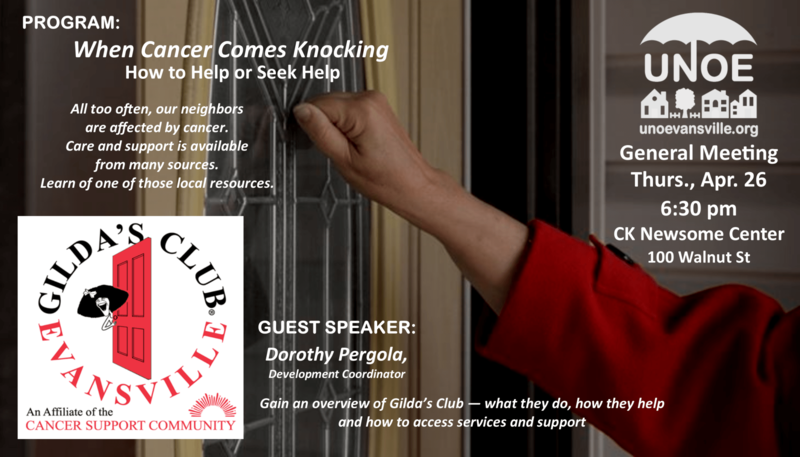 26 – 6:30pm at the C K Newsome Center, 100 Walnut St.
Our guest speaker will be Dorothy Pergola, Development Coordinator with Gilda’s Club Evansville, sharing the program When Cancer Comes Knocking: How to Help or Seek Help. All too often, our neighbors are affected by cancer. Care and support is available from many sources. Learn of one of those local resources. Join us at the General Meeting in April! at the C.K. Newsome Center. More than classes, courses and degrees, did you know that Ivy Tech faculty and students volunteer in the community through outreach/service learning events? 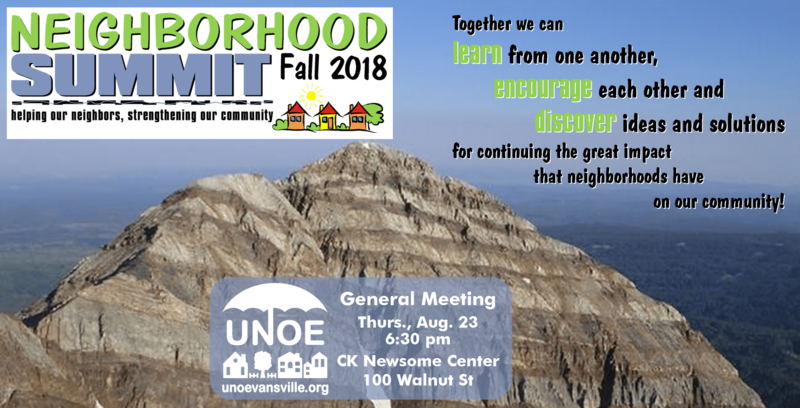 Come with your ideas of how some extra volunteers might help your Neighborhood Association better accomplish its goals! 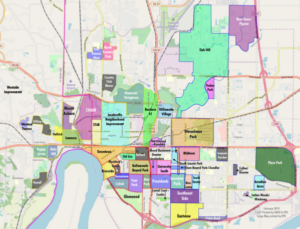 Also, learn about the benefits of Ivy Tech through the Senior Scholars program, Workforce Ready grant-funded Next Level Jobs program and additional affordable educational opportunities. Join us at the General Meeting in March!